Eläkeläiset from Finland are always welcome to bring you some unexpected surprises. In the beginning, it was their unconventional way to cover pop and rock songs in polka versions, then the chaos and madness they've been spreading around on stage and finally the decision to write and play own songs. The newest surprise is that they sing in German as a tribute to the soccer world championship in Germany, an idea which also is reflected on the cover artwork, showing drawings of the five musicians as members of FC Humppa. The album only contains a single cover version, Das Model by Kraftwerk. The German accent is entertaining as well as the typical Eläkeläiset sailor choir, but the guitar solo at the end of the song is unusual for this band. Auf Entzug-Humppa and Samstagtanzen are two hilarious dance songs with a lots accordion essential for every good senior citizen party. Ona Nur is another humppa classic with funny lyrics about sports and love. The EP ends with the calmer and sadder Humppakavalier, describing the boring everyday life of a gigolo, of course without neglecting the humorous side known from Eläkeläiset. I was a bit surprised that this EP was released only two months after Humppasirkus, their last regular CD. 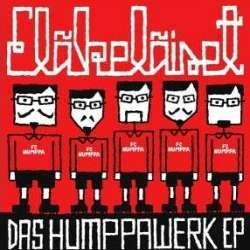 But as both CDs have different concepts, the idea isn't so bad after all, making Das Humppawerk another milestone in the mad Finns' discography.